Encouraged by all the new Scythes fiction inbound this coming year (looking forward to it Laurie! ), I’ve gotten myself into gear, time to begin creating models for the Flight of the Tenax campaign ASAP. 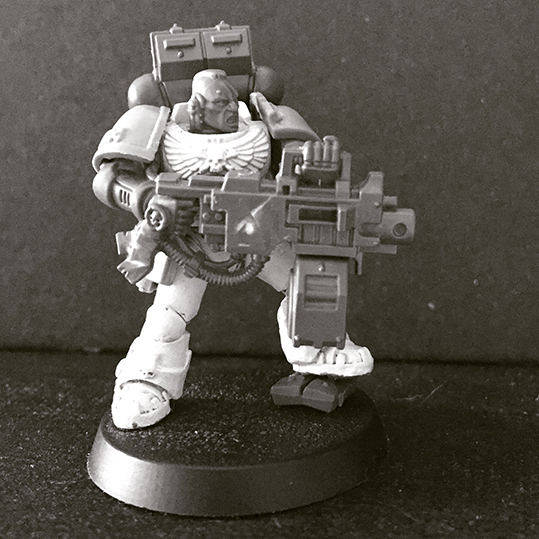 First up is Gideon, a Veteran Brother of the Scythes, Fifth company. Notable marksmen with bolt pistol and paragon of being loaded for Grox. Gideon is the immovable object to oppose any irresistable force that comes up against the Scythes battle plan. I chose to downplay his pose, express a certain inevitability of his approach. He’s composed and approaching to do battle with an outcome he has already decided. Next up is Eunos, a ten year veteran of the Scythes. Very cool under pressure however rather fractious when left without task. He and Castus protected the landing ramp of the Tenax during the rapid depature of Xaver, Gideon and Melecar when the convoy lifted for orbit. I’ll be adding more details and base dressing when I close in for the paint work. Below is a size comparison with the younger Neophytes aboard the Tenax. 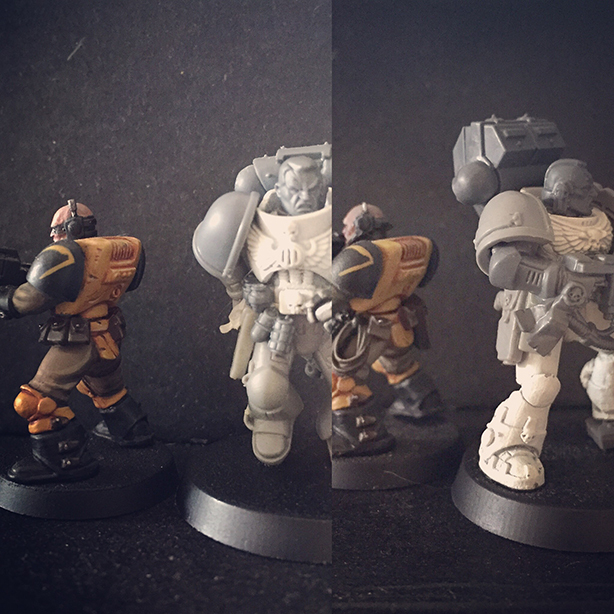 I’ll be using this larger scale marine format going forward rather than TrueScale style seen in Inquisimunda/Inq28 format. It will be much easier to access the vast array of Marine armor and weapon plastics, detailing the Scythes of the Tenax; when their gear wears out or is replaced from battle damage during the campaign. With limited supplies and odd equipment discoveries, they should be quite different and individualistic in the future. On lift off, the Scythes of the Tenax have 12 Astartes and 18 Neophyte combat effective. Day 1. We’ll see what tomorrow brings when I finish two more Astartes for the Ship Clearing missions. Brilliant! More Scythes! I love the pose and character of them both. I like how brother Gideon has a pose that reads as both rock-solid and active. How hid you achieve their enlargement? I think you raised them at the waist, but it seems there is also more subtle trickery involved? Indeed sir! About time too! You pretty much summed up what I wanted with Gideon. He’s the right hand man of Xaver, the defacto leader of this desperate band of survivors. Enlargement wise, bang on – waist has been elevated for a deeper belt line. I also used an insert between front and back of torso to deepen that. In addition I have added spaces to the upper hips. Subtle, but it adds up. I may refine it further as the models tend to pinch at the torso. Ah, so that was what I was seeing, that front to back insert. Now that you mention it, their collars are obviously a lot roomier than stock torsos. 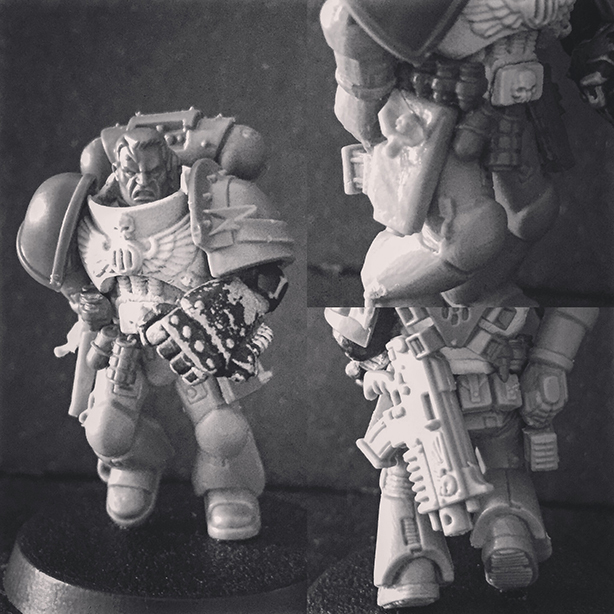 I get what you mean about the pinched torso, a couple of years I tried a similar conversion, and he looked positively serpentine, despite my bulking out his hips. The gear hides it nicely. Indeed, have to do some very fine GS work around the gap there, fiddly urgh. haha.